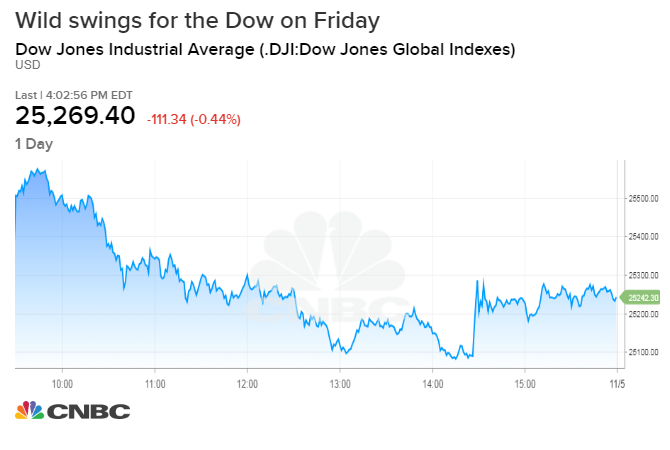 Stocks traded in a wide range on Friday as investors digested different comments and reports on global trade, while Apple shares dented the broader tech sector. The Dow Jones Industrial Average closed 109.91 points lower at 25,270.83 after falling 300 points earlier in the session. At its session high, it was up as much as 198.24 points. The S&P 500 pulled back 0.7 percent to 2,723.06 as Apple's 6.6 percent decline dragged down other major tech names like Facebook and Alphabet. The tech-heavy Nasdaq Composite dropped 1 percent to end the day at 7,356.99. The major indexes pared some of their losses after President Donald Trump told reporters the U.S. and China are much closer to striking a deal on trade, saying the two countries will have a good deal in place. Trump's comments come after Larry Kudlow, his top economic advisor, told CNBC there is no trade plan in the works for China. "There's no massive movement to deal with China," Kudlow told CNBC's "Halftime Report. " "We have already put out asks to China with respect to trade." "We're doing a normal, routine run-through of things that we've already put together and normal preparation," he said. "We're not on the cusp of a deal." When asked whether the president explicitly requested his top advisors to drum up a trade deal, Kudlow said "no." Kudlow's comments sent equities to their lows of the day. Meanwhile, Kudlow's remarks contradicted a Bloomberg report from earlier on Friday that said Trump had asked officials to prepare a draft for a U.S.-China trade deal. "It's still all about trade," said JJ Kinahan, chief market strategist at TD Ameritrade. "Most of the trading we're seeing is related to earnings or trade." "The recent moves we're seeing are reflect a return to more historical levels of volatility," said Kinahan. "I don't think this will abate." "Today's stronger than expected October employment report was a mixed bag for stocks," said Alec Young, managing director of global markets research at FTSE Russell. "On the positive side, strong job growth will allay fears of slowing economic growth. However, with wages up 3.1 percent year over year … it will be more difficult for the Fed to slow its rate hiking campaign." Investors are worried that rising wages and increasing inflationary pressures will push the Federal Reserve to raise rates at a faster pace than expected. The central bank has hiked rates three times this year and is forecast to raise them once more before year-end. "There's good news for everyone in this report, but it also makes it clear that the economy is running a little bit faster than we can probably sustain," said Jason Thomas, chief economist at AssetMark. "The Fed must, and is trying to, slow down the economy" so growth remains sustainable. Treasury yields rose following the data's release. The benchmark 10-year note yield traded around 3.21 percent while the two-year yield climbed to 2.91 percent and hit its highest level in a decade. —CNBC's Spriha Srivastava and Sara Salinas contributed to this report.